So, I've found a CC version that is pretty similar - more on that in a minute... here's the rules. 1. Think about what you are passionate about teaching your students. 2. Post a picture from a source like FlickrCC or Flickr Creative Commons or make/take your own that captures what YOU are most passionate about for kids to learn about…and give your picture a short title. 3. Title your blog post “Meme: Passion Quilt” and link back to this blog entry. 4. Include links to 5 folks in your professional learning network or whom you follow on Twitter/Pownce. 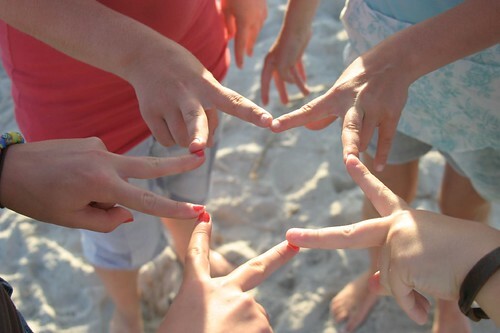 Collaboration And Linking With Others Makes You A Star! The thinking behind my photo was that it had to be about learners, be they students or educators or anybody. How do they/I learn best? By collaborating and linking up with others - you can learn by yourself but not in isolation from everything/ everyone. Everything you learn has a connection to someone else. Also, every time you learn/ create something, it becomes more powerful when shared/ linked with others. Who am I tagging? Let's go for some of the most passionate people I know on my network. I just hope that Alex doesn't throw up my Open Educator logo as his example - it could end up well utilised in the near future anyway. Posted in Personal Reflections, Web 2.0 on March 21, 2008 by Graham.